If I could choose between a cake or creamy desserts, I think I would always go for the cake. I just love pastries, no matter if it’s buttery shortcrust, flaky puff pastry, soft sponge, or juice-soaked lady fingers in a trifle. The combination of flour, butter, eggs, and sugar is pure magic in my eyes. Since I was a child, I’ve always been the first at the cake buffet when we have our luscious family feasts, and I’m also the last one, when the platters are almost empty. As I’m the one who’s responsible for sweet treats at home – at least most of the time – we barely get to enjoy the dark depth of a mousse au chocolate, the sweetness of a vanilla scented Bavarian cream or a crème caramel. If my boyfriend could choose, it would be the other way around; we’d have cake maybe twice a year. 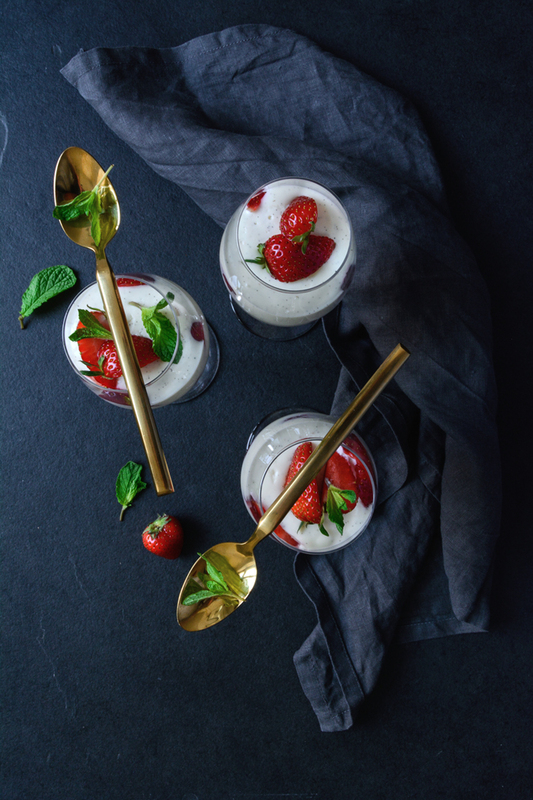 He loves anything sweet, smooth, and creamy and if I want to spoil him a little, I make a panna cotta. 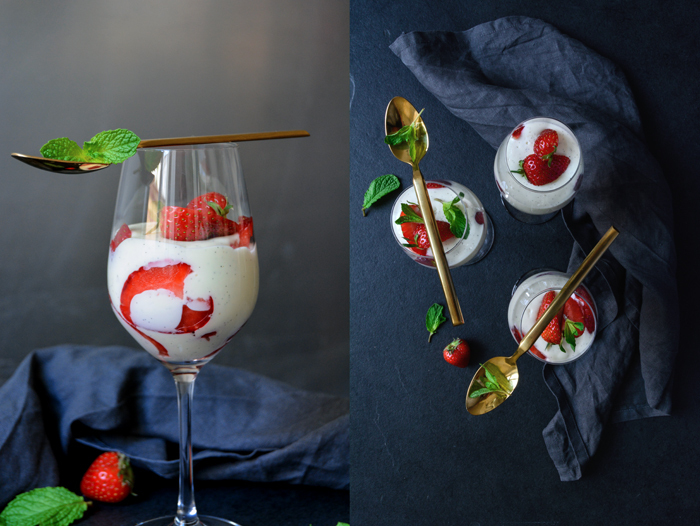 The Italian classic is usually made with heavy cream and milk, but I like to sneak in some ricotta (like I did for my rosewater and pistachio panna cotta), or a little mascarpone, which fits perfectly to the juiciest strawberries I’ve found this year so far. A bit of fresh mint on top and these little beauties are done. When we have guests for dinner, I usually serve this dessert in small ramekins, but this time I went for wine glasses. 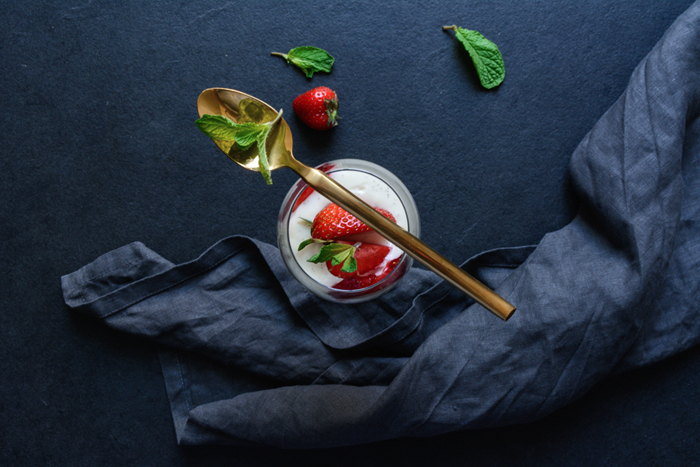 The shiny red fruit looks really pretty in the bright panna cotta, it would be a pity to hide them. In a small saucepan, bring the cream, milk, salt, vanilla seeds, and sugar to the boil. As soon as the mixture is bubbling, take the pan off the heat. Squeeze the excess water from the soaked gelatin sheets and crumble into the warm cream mixture; whisk thoroughly. Stir in the mascarpone and whisk until well combined. Leave the cream in the saucepan and let it cool at room temperature for about 30 minutes, whisking occasionally. Then chill the panna cotta in the fridge for about 1 hour, whisking 3-4 times, or until it starts to set. 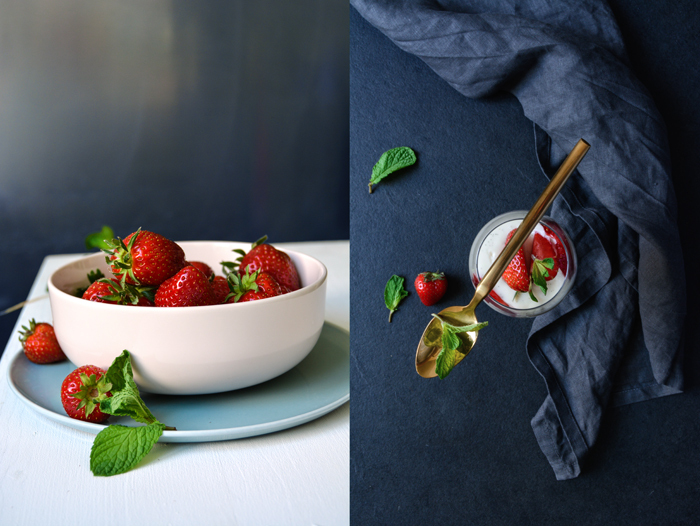 Divide the sliced strawberries between 4 ramekins (120ml / 4 ounces), or 2-4 wine glasses, and sprinkle them with a little sugar. 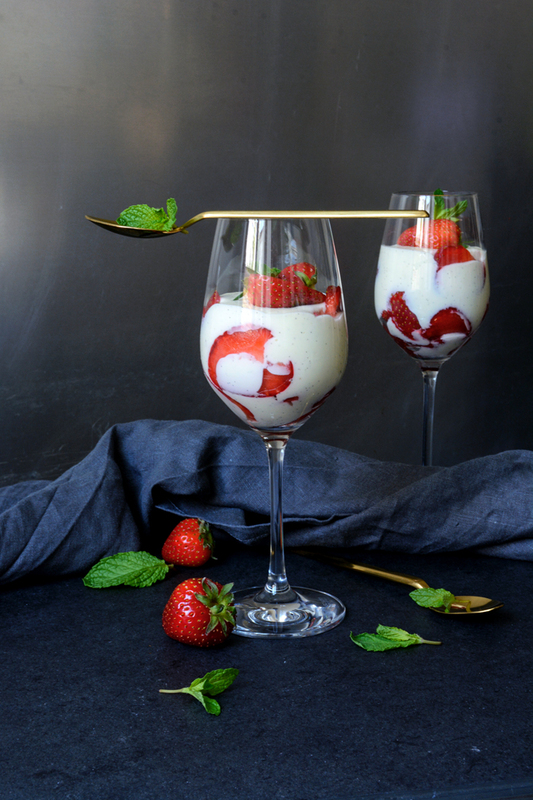 Divide the panna cotta between the glasses and chill for about 30 minutes or until set. 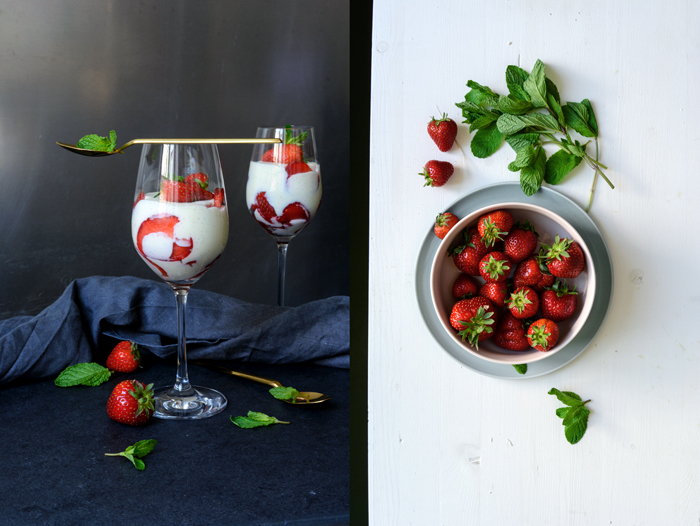 Arrange the quartered strawberries and the mint leaves on top of the cream just before serving. Panna cotta is one of my favorite desserts. I have everything to make this today…know what dessert will be tonight! Thanks for sharing your beautiful photos. Thank you Marigene! 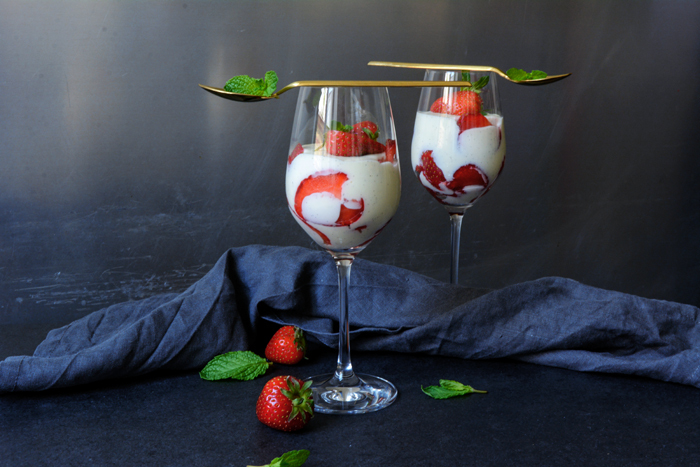 Panna cotta is the perfect summer dessert, it’s not too heavy and it tastes fantastic in combination with fruits. I can’t wait to add red currants and gooseberries, but they’ll still need a few more weeks. Enjoy and have a wonderful week! 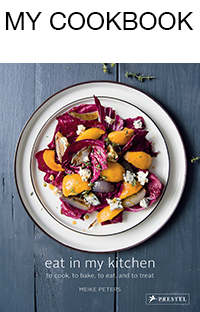 This is the perfect summer dessert! I love the slices of strawberries mixed in there!